“Elvis asked him if he had been faithful, and the man told the truth. The King answered him, “To thine own self be true, baby. You did what you had to do when times were tough. But you never shifted from the Word in your heart. I see it written there. And in the end you came right back to where you belong. To Elvis the King, and to His Word.” The Word is in my heart. And in the end I will come right back to where I belong just as He said. Yes. I’m in danger, just like the man was when he was robbed. And so are you, too.” He reached up and took his hair back up, reached into the scalp side. There was a single beep, and the hair retracted until it vanished into a thick, flexible golden ring. He undid a catch in it, hung it around his neck, then took off the sequined jacket. The ‘jumpsuit’ was two pieces, the jacket’s hem buttoning inside the waistband of the pants. Once the jacket was off, he was a bald man with white slacks and a white tee shirt with an odd U-shaped scoop neck, and a funky gold chain. Not too flashy, at least not for Vegas. “Not likely. I’ll be hard to pick out of a crowd without a coif. There’s really nothing else for them to find me by. I should have hidden the thing when I showed up.” He hung his head. “I haven’t gone about this the smartest way,” he said. I realized that behind us, I could hear an idling car. It seemed to me that it had been there idling for a while. Maybe only seconds, maybe minutes. It was hard to tell. For people who live in cities, the idling of a car is a natural background noise that often passes without raising a thought, like the rustle of leaves in the wind or the distant honking of geese in the country. Maybe it was all of the coffee. Maybe something I had seen in the edge of my vision in an unconscious glance over my shoulder finally registered. Maybe it was something… else. 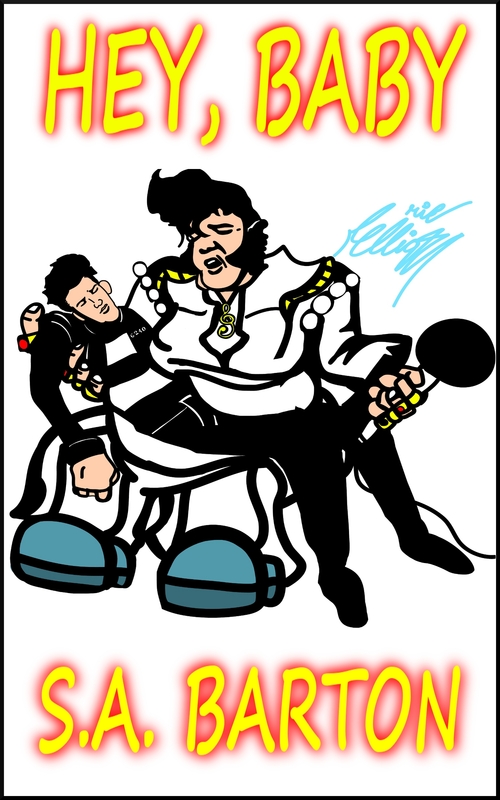 But without thought, without a look to see if my suspicion was justified, I grabbed Elvison by the shoulder of his T-shirt and yanked him past me, toward the narrow concrete stairs. He wasn’t a small man at all, but I moved him easily, as if he were nothing more than a teddy bear full of fluff. Teetering in surprise, he descended in a jerky, barely-controlled dance. Squiggly heat-lightning pulses cut the aluminum railing to shiny scraps where he had been a moment ago. I followed Elvison into the stairwell, sneezing at the stink of burned hair from where their shots had nearly clipped my ear and arm. “One thousand years! Where’s your god now, hairball?” one of the Rikers shouted from behind us. We hit the back of the stairwell in a shower of pulverized cinderblock. The air just over our heads swam with the distortion of their gunfire as it ripped into the wall. We ducked down the next flight, moving as fast as we could without falling. Above, the Rikers’ car revved and tires squealed as they followed us down the much longer car ramp. “Hairball?” I asked between gulps of breath. “Makin’ fun of the coif,” he answered. We reached the bottom of the stairwell and Elvison shouldered through the emergency exit. A light over the door began to flash red and the jangle of alarm bells filled the parking garage as we left it behind. Nothing but a thin strip of gravel landscaping and a narrow sidewalk separated the exit from the street. A few cars flicked by in the mostly-empty street, their drivers’ eyes wide as they looked toward the noise of the alarm. Above, tires screamed as the Rikers tore through the garage. They were only a couple of levels up, coming down fast. Somehow, I didn’t think they’d take the time to stop and pay on the way out. “Come on,” I said, and bolted into the street with Elvison on my heels. Horns blared, no crashes. Traffic was still light. But as we reached the other side, I heard a short bwoop from a siren, saw red and blue reflect off the glass front of the fried chicken restaurant in front of us. “Stay where you are,” an amplified voice said from the police car we had run out behind. It swung into a U-turn to come down our side of the street.